The social sciences rely more on the comparative method than on experimental data mainly because the latter is difficult to acquire amongst human populations. 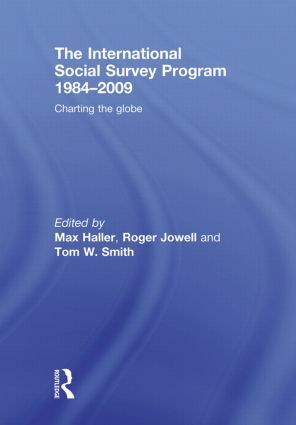 The International Social Survey Programme has played a pioneering role in creating and sustaining methodologically-sophisticated mass attitude surveys across the globe. Starting in 1984 with five nations, it now encompasses forty-five nations spread over five continents, each administering an identical annual survey to a random sample of their population. Analyses of the data or descriptions of the methodology already appear in over 3,000 publications. This book contains new contributions from three dozen eminent scholars who analyse and compare the perceptions and attitudes of citizens across all five continents, nations and over time. Subjects range from inequality and the role of the state; ethnic, national and global identities; the changing relevance of religion, beliefs and practices; gender roles, family values and work orientations; household and society. Some chapters focus on methodological issues; others focus on substantive findings. This book sets new standards for cross-cultural research. Attitudes towards state-organized welfare in twenty-two societies: a question of convergence? Participation in voluntary activities in Austria and Australia: how valid are the results of international social surveys?